The primary purpose of an electronic portal imaging device (EPID) is patient localization during radiotherapy treatment. The EPID has a number of important features for dosimetry applications: its integration with a linear accelerator, high resolution, fast image acquisition, and large imaging area. The latest generation of EPID is an amorphous silicon (a-Si) consisting of phosphor scintillator and photodiode detectors. A well-established acquisition mode for dosimetric application is integrated mode. The a-Si EPID captures a single image consisting of the average number of frames acquired during radiation delivery where a frame is a single scan of all rows. An alternative acquisition mode is cine mode, which is attractive for the assessment of dynamic procedures. In cine acquisition mode, a sequence of multiple images are captured during radiation delivery instead of a single integrated image. Since cine mode is synchronized to beam pulses, the frame acquisition rate depends on dose rate. The dosimetric properties for a Varian a-Si EPID when operated in integrated mode are well documented. Due to the presence of a phosphor layer, the a-Si EPID response has different responses from that measured by an ionization chamber. Therefore, to convert an EPID image to dose, a number of corrections were required., Linearity was reported within 2% for 20 monitor unit (MU) and reproducibility within 2% for static and dynamic fields. While the investigation of the use of EPID in integrated mode has been expansive, comparatively few investigations have been reported the influence of cine acquisition mode on the dosimetry of a Varian a-Si EPID. As dosimetric application of the EPID operated in cine mode increases,,, the influence of cine acquisition mode on the EPID dosimetric characteristics requires further research as the few studies that have been conducted primarily focused on reproducibility, linearity with high delivered dose, and uniformity across the image. This study aims to investigate whether or not cine acquisition mode will impact on the EPID's dosimetric performance, including factors: the delivered dose, dose rate, multileaf collimator (MLC) speed, field size, phantom thickness, and common IMRT fields. This study includes an assessment of the performance of cine acquisition mode against the well-documented integrated acquisition mode and dose measurements using an ionization chamber. The a-Si-500 EPID is fixed to a Varian linear accelerator 21iX (Varian Medical Systems, USA). The EPID was irradiated with photon beams of 6 and 18 MV using a dose rate of 600 MU/min, at source to surface distance (SSD) of 150 cm at gantry. The collimator was set to zero unless otherwise specified. The EPID had a sensitive area of 40×30 cm 2 divided into 512×384 detector elements, yielding a pixel pitch of 0.784 mm. Images were acquired by the acquisition IAS3 software version 8.2.03 (Varian Medical Systems, Palo Alto, CA) and calibrated according to the manufacturer's protocol. For acquisition parameters, trigger delay was set to 6 ms, which was the waiting time between the beam pulse capture and the start of row scanning. All beam pulses from the beam were captured. The default frame rate was 12.8 frame/s, and some were set to 8.001 frame/s. The number of frames per image was one. Images were analyzed using MATLAB vR2012 software (MathWorks, Natick, MA, USA). In each image, the response of the EPID was determined through mean pixel intensity values in a region of interest (ROI), 11×11 pixels at the center of field. The standard deviation represents the intensity variation between these pixels for a given image. As cine mode generates several images for a given MU, total dose is calculated by summation of pixel values over total acquired images. MUs of 5, 10, 15, 20, 25, 30, 40, 50, 60, 75, 90, 100, 200, 300, and 400 were delivered for a field size of 10 cm×10 cm for 6 and 18 MV at dose rates 600 and 400 MU/min. Linearity is the reduction of central pixel value/MU normalized to the value for the maximum MU of irradiation for each beam. Further analysis was conducted to evaluate the number of acquired cine images in each MU delivery with different dose rates and a constant frame rate. The number of images acquired in each MU delivery was normalized to the maximum MU setting. To calculate missing images, the numbers of acquired images in each MU delivery were subtracted from the expected acquired images. Expected acquired images were derived from delivery time per irradiation and the frame rate (calculated manually based on the dose rate). The calculations of missing images in each delivery were averaged for each dose rate. The distance from source to EPID sensitive layer varied below isocenter from 10, 20, 30, 40, 50, and 60 cm. For each distance, images for a field size of 10 cm×10 cm were acquired for deliver 10 MU. All results were normalized to the values of maximum distance. Dynamic MLC deliveries were performed with a uniform 1 cm leaf gap between the two banks of MLC leaves for a 10 cm×10 cm field. The leaf speed was changed by varying the number of MU from 600 to 40, results were normalized to those of the minimum MLC speed. Open square fields of side: 4, 5, 8, 10, 12, 15, and 20 cm were delivered with 100 MU. Results were normalized to that response for maximum field. Thickness from 0.2 to 15 cm of homogeneous solid water slab phantoms (RW3, PTW) was placed on the treatment couch with the EPID panel, gantry was positioned at 270°. Care was taken to minimize the air gap between the EPID and slab phantom. All measurements were delivered with 100 MU for 6 and 18 MV using a field size of 10 cm×10 cm. The results were normalized to those of the maximum thickness. A clinical dynamic IMRT prostate plan was delivered using 6 MV and a dose rate of 400 MU/min. The cross profile through the central axis of summation cine images for each field was examined. Measurements were repeated using the integrated acquisition mode. Integrated dose for a given MU was calculated by multiplying the mean pixel value at ROI by the number of frames acquired. Measurements were also performed using an ionization chamber CC13 (Scanditronix Wellhofer, IBA) in combination with an electrometer that was positioned on the beam central axis at a depth of 1.5 and 3 cm for 6 and 18 MV, respectively. For a graphical comparison between EPID operated in cine and integrated modes and ionization chamber measurements, all results were normalized to detector response. Previous dosimtery characteristics were evaluated using normalized responses. Absolute response of cine mode was shown as it is required for the conversion of signal to dose. 100, 200, and 300 MU were delivered using a field size of 10 cm×10 cm at a dose rate of 600 MU/min for 6 and 18 MV with a constant frame rate. [Figure 1] shows the response of the EPID operated in cine and integrated acquisition modes and ionization chamber response, which were normalized to the detector response at maximum MU setting. When delivering 5 MU with photon energy 6 MV, the image acquisition software was unable to yield images for cine mode; therefore, the graph shows the response of cine mode for 6 MV starting from 10 MU. 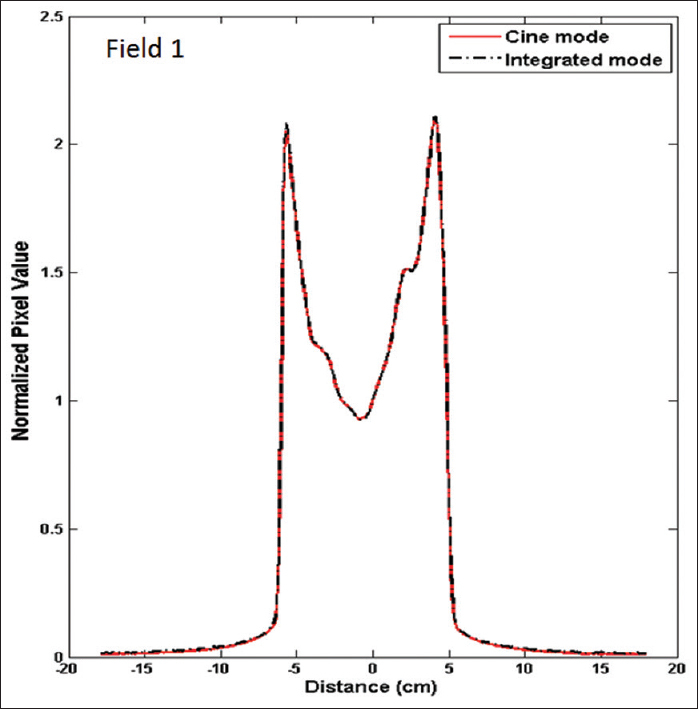 Results illustrate that EPID using cine mode has a nonlinear response for small MU for both energies, when delivery was 10 MU, the response in cine mode was approximately 0.5 and 0.64 for 6 and 18 MV, respectively. In contrast, responses of EPID using the integrated mode and ionization chamber for delivery using the same MU for 6 MV were 0.95 and 1.01, respectively. 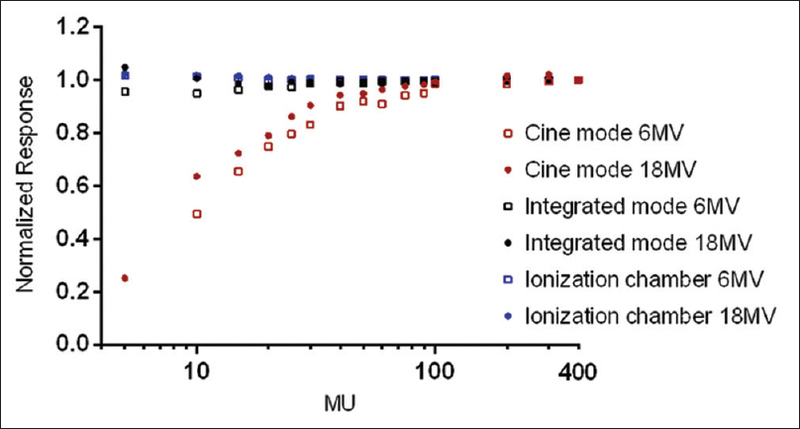 The response of EPID using cine mode with an increased MU became linear and comparable with the integrated mode and ionization chamber within <2% when delivered at100 MU. The correlation between an EPID response operated in cine mode and the corresponding number of acquired images in each MU delivery as function in dose rates is presented in [Figure 2]. The EPID response in each delivery was consistent with the corresponding number of acquired cine images in that delivery and these were nonlinear for a range of MU for both dose rates. The degree of nonlinearity for 600 MU/min was higher compared to 400 MU/min, differences were approximately 12.3% for a delivery of 20 MU. In addition, the missing images were calculated and it was four images for each delivery for both dose rates. It should be noted that the calculations in this study ignored the effect of trigger delay on frame rate. Furthermore, beam output was assumed to be constant in particular dose rates. Results in [Figure 3] demonstrated that when 10 MU are delivered, the response of EPID operated in cine mode matches well with the integrated mode and ionization chamber responses within 2% for both photon energies. 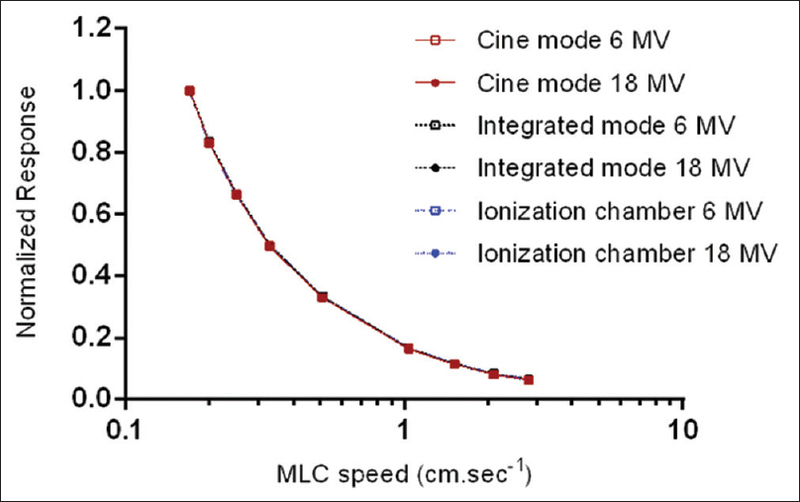 The results in [Figure 4] show that an EPID using cine mode has a response similar to one using the integrated mode and ionization chamber measurements for a range of MLC speed from 0.17 to 2.8 cm/s. However, an EPID operated in both modes has a slightly lower response compared to ionization chamber at a higher MLC speed. The maximum deviation between cine mode response and ionization chamber is approximately 2.9% for 18 MV at 2.8/cm. 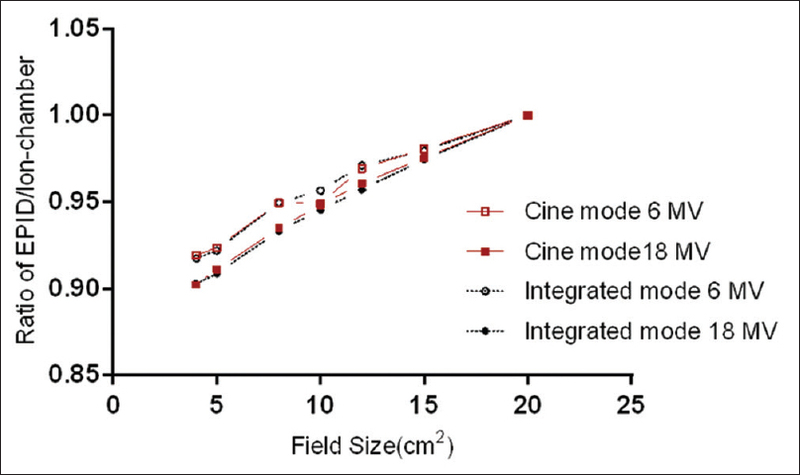 The ratios of EPID to ionization chamber as function in field size show that cine mode has a comparable response with the integrated mode within <1% for both energies [Figure 5]. [Figure 6] shows that the EPID response operated in both modes with respect to phantom thickness were comparable within 1.5%, and the buildup region does not appear entirely with 6 MV. However, it is mostly visible with 18 MV. An EPID response beyond the dose buildup region (depth >~3.5 cm) was comparable with the ionization chamber within 1%. A good agreement between normalized cross profiles at the center of field of cine and integrated images for clinical IMRT fields was noticed. An example of one IMRT field is shown in [Figure 7]. The mean pixel values of images using cine and integrated modes were within 2% for cine and integrated mode for 200 and 300 MU for a given energy, while for 100 MU, the mean pixel value of cine images was 5% less than integrated images [Figure 8]. The mean pixel value of images was higher with 6 MV compared to 18 MV. The nonlinearity of EPID response when used in cine acquisition mode with low MU was previously reported as being due to either dose rate irregularity  or missing four images quantified by the frame grabber systems. The results of this study showed that the nonlinearity of EPID response was due to missing acquired cine images in each delivery. Nonlinearity is due to the four images that were lost, which were quantified by calculation using frame rate and dose rate. The missing images occurred at each acquisition session, but with the increased delivered dose, the impact of the missing image made less contribution compared to the total delivered dose. The degree of nonlinearity was observed to be higher with a higher dose around 12.3% for 20 MU even though the numbers of missing images are similar for each dose rate. This is because the dose per image in the acquisition system will increase automatically with increased dose rate; hence, the missing images will be more significant with a high dose rate. For dosimetry applications, we recommend that the calibration of the EPID should be run at large MU to minimize the impact of missing images. Furthermore, when IMRT verification field has low MU (<100 MU) and a high dose rate, the correction of missing images is required. Missing images could be compensated by quantify dose equivalent to four images. This dose is then added in each field. To investigate the effect of changing the dose rate for very low MU (10 MU) while keeping the dose per image constant, the dose rate was changed by changing the source to detector distance. An EPID operated in cine mode showed comparable response to its response using integrated mode and an ionization chamber. The comparison in performance confirmed that changing the dose rate does not have an influence on the nonlinearity of the EPID response using cine mode, and that nonlinearity was caused by missing images. It should be mentioned that the ghosting effect was reported to be within 1% for EPID in Varian machines while it is reported to be about 5% in Elekta machines., In addition, a number of models that convert EPID signals to dose have been shown to be effective without correcting this effect when using Varian EPID., Therefore, in this study, ghosting effect was not examined. Because the accelerator may reduce the dose rate when the MLC cannot reach a predefined position with maximum leaf speed, large dose-rate variations during dynamic IMRT or VMAT deliveries are possible. Results showed that cine mode can record the rapid temporal changes in dose rate that occur during dynamic MLC deliveries with performance similar to integrated mode and ionization chamber. 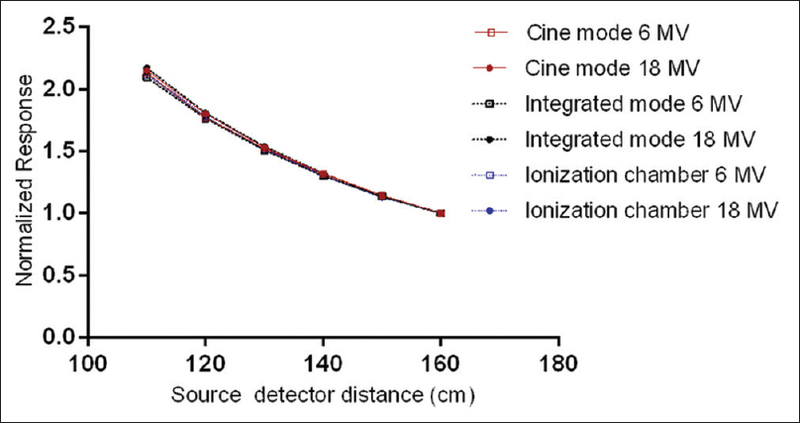 The slightly lower response of the EPID operated in cine to ionization chamber is not related to the cine mode itself as integrated mode has a similar lower response. This may be due to the physical structure of EPID with respect to MLC-transmitted radiation, response of the EPID to MLC-transmitted radiation was different than for open beams due to the removal of low energy photons by the MLC., This result validates the suitability of cine mode for delivery including rapid changes in dose rate such as VMAT delivery. Results for output factor, phantom thickness, and common IMRT fields showed that using cine mode does not influence EPID performance, and both integrated and cine modes deviated from ionization chamber response. The reason for the EPID deviation using integrated mode was explained in detail previously and is mainly due to the presence of a phosphor layer., Results for EPID in both modes indicated that no extra correction is required for converting the EPID to dose when using cine mode compared to integrated mode, and we can use the integrated mode to extract correction factors. Absolute pixel value for an EPID operated in cine mode was slightly lower compared to an EPID using the integrated mode for delivering 100 MU. This may be due to missing images associated with the use of cine mode. Absolute pixel value for the EPID decreased with an increase in energy for both modes. This may return to the results in [Figure 6] showing that the signal of the EPID for 6 MV was higher due to the limited buildup region being more adequate compared to 18 MV. The inherent water equivalent thickness of materials in front of the EPID is 8 mm. Therefore, for dosimtery application, the absolute pixel value was dependent on photon energy used. With the objective of using the EPID in cine imaging mode to provide an opportunity to analyze the images as a time-lapse series, this study examined the dosimetric response of a Varian EPID when using cine acquisition mode, specifically for dose delivered and dose rate with low MU. The main limitation of cine mode is that the four images that are dropped in each delivery which were quantified by calculations. This results in the nonlinearity of cine mode at some of MU. The degree of nonlinearity is dependent mainly on the dose per frame, which was influenced by selecting dose rate. Therefore, for dosimetry application, to minimize the effect of missing images, calibration of the EPID images using cine mode to convert signal to dose should be run at large MU. Moreover, when IMRT verification field has a low MU (<100 MU) and high a dose rate, a correction of missing images is required. Despite nonlinearity, results confirmed the efficiency of cine mode with rapid variation in dose rate such as VMAT delivery. In addition, EPID performance including dose rate, MLC speed, field size, phantom thickness, and IMRT field using cine mode is comparable to its response using the well-documented integrated acquisition mode. It is indicated that, for dosimtery application, no further correction factors for these properties are specifically required for EPID when operated in cine acquisition mode, and the possibility of using similar correction factors for both acquisition modes was confirmed in this study. This may minimize the workload related to derive correction factors. The first author acknowledges the financial support given by Saudi Arabian Cultural Mission for this research. Inhwan Yeo (Loma Linda University Medical Centre) is thanked for providing information about parameter in IAS3 software. Stefano Peca (University of Calgary) is thanked for editing of manuscript. The study was supported by Saudi Arabian Cultural Mission. van Elmpt W, McDermott L, Nijsten S, Wendling M, Lambin P, Mijnheer B. A literature review of electronic portal imaging for radiotherapy dosimetry. Radiother Oncol 2008;88:289-309. Greer PB, Vial P. EPID dosimetry. In: Concepts and Trends in Medical Radiation Dosimetry: Proceedings of SSD Summer School. AIP Publishing; 2011. p. 129-44. doi: 10.1063/1.3576163. Yeo IJ, Jung JW, Patyal B, Mandapaka A, Yi BY, Kim JO. Conditions for reliable time-resolved dosimetry of electronic portal imaging devices for fixed-gantry IMRT and VMAT. Med Phys 2013;40:072102. Kavuma A, Glegg M, Currie G, Elliott A. Assessment of dosimetrical performance in 11 Varian a-Si-500 electronic portal imaging devices. Phys Med Biol 2008;53:6893-909. Fidanzio A, Mameli A, Placidi E, Greco F, Stimato G, Gaudino D, et al. EPID cine acquisition mode for in vivo dosimetry in dynamic arc radiation therapy. Nucl Instrum Methods Phys Res 2008;266:658-66. McCurdy BM, Greer PB. Dosimetric properties of an amorphous-silicon EPID used in continuous acquisition mode for application to dynamic and arc IMRT. Med Phys 2009;36:3028-39. Peca S, Brown DW. Two-dimensional in vivo dose verification using portal imaging and correlation ratios. J Appl Clin Med Phys 2014;15:4752. Liu B, Adamson J, Rodrigues A, Zhou F, Yin FF, Wu Q. A novel technique for VMAT QA with EPID in cine mode on a Varian TrueBeam linac. Phys Med Biol 2013;58:6683-700. Image Acquisition System 3 Reference Guide, Document ID P1001581: Varian Medical System, Palo Alto (CA); Jun. 2013. Winkler P, Hefner A, Georg D. Dose-response characteristics of an amorphous silicon EPID. Med Phys 2005;32:3095-105. Sabet M, Rowshanfarzad P, Menk FW, Greer PB. Transit dosimetry in dynamic IMRT with an a-Si EPID. Med Biol Eng Comput 2014;52:579-88. Matsumoto K, Okumura M, Asai Y, Shimomura K, Tamura M, Nishimura Y. Dosimetric properties and clinical application of an a-Si EPID for dynamic IMRT quality assurance. Radiol Phys Technol 2013;6:210-8. Kirkby C, Sloboda R. Consequences of the spectral response of an a-Si EPID and implications for dosimetric calibration. Med Phys 2005;32:2649-58. Kim JO, Siebers JV, Keall PJ, Arnfield MR, Mohan R. A Monte Carlo study of radiation transport through multileaf collimators. Med Phys 2001;28:2497-506. Gustafsson H, Vial P, Kuncic Z, Baldock C, Greer PB. EPID dosimetry: Effect of different layers of materials on absorbed dose response. Med Phys 2009;36:5665-74.